When someone refers to a "collie," many people think of the iconic image of Lassie – the dog made popular by Eric Knight’s novel and the MGM television production. However, the term collie more broadly refers to a collective of dogs with similar traits – including the border collie, Australian collie, bearded collie and Shetland sheepdog. 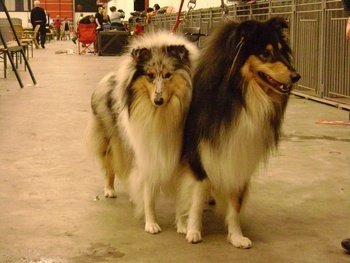 The image of Lassie-type collie is actually what’s known as a "rough" collie or long-haired collie. They were originally bred for herding and driving livestock during the 1700s in Scotland and Wales. The dogs from the two areas had distinctly different characteristics – the Scottish version was large, strong and aggressive in order to herd highland sheep, while the Welsh variety was smaller, more nimble and was used to herd goats. The two were crossed and then likely mixed with Borzoi (which resulted in the long tapered head) to produce the foundation of today’s breed. While a working dog in ancestry, the shift toward the conformation ring and companion pet exploded after Queen Victoria acquired one in the 1800s. The continued breeding for these purposes has reduced the herding instinct in many lines; the result being that today the instinct is very hit or miss – if you’re looking for a working collie, get a dog from lines that compete in herding events. The rough collie has a long, layered double coat that requires much attention to keep it from matting – especially if the dog has the opportunity to frolic outdoors where burrs and grass awns can become trapped. Shedding of the long hair will require constant clean up around the house (collies are people dogs and like to be engage with their family; leaving them alone outside will likely result in an unhappy dog) and of clothing – keep a lint brush handy! Properly socialized, collies are psychologically stable dogs with very little aggression shown beyond barking. They’re loyal family dogs and possess a keen intelligence. Due to their nature as herding dogs, they can be a bit vocal; something to keep in mind if you have neighbors in close proximity. Because of their athletic build and intelligence, collies excel at agility, obedience and herding events. Collies are medium-sized dogs that weigh between 50-70 pounds, and live approximately 10-14 years. For the most part, collies are healthy dogs. However, the few ailments that plague the breed are serious matters. Asking for proof of genetic testing of parents will help ensure that you’re getting a healthy puppy. At Paw Print Genetics, we offer a collie panel that includes the breed-specific collie eye anomaly, degenerative myelopathy, multidrug resistance 1 and Von Willebrand disease II.